NASHVILLE, Indiana (Aug. 11, 2016) – An upcoming auction of 604 acres of rolling land near Nashville, Indiana, will include tracts for hunting, row crops, livestock and equestrian use. Schrader Real Estate and Auction Company will conduct the auction. “A great deal of thought and work has gone into every aspect of this master planned property, and the result is just amazing. Taken as a whole, it has 10 ponds and lakes, with numerous sites for additional lakes. 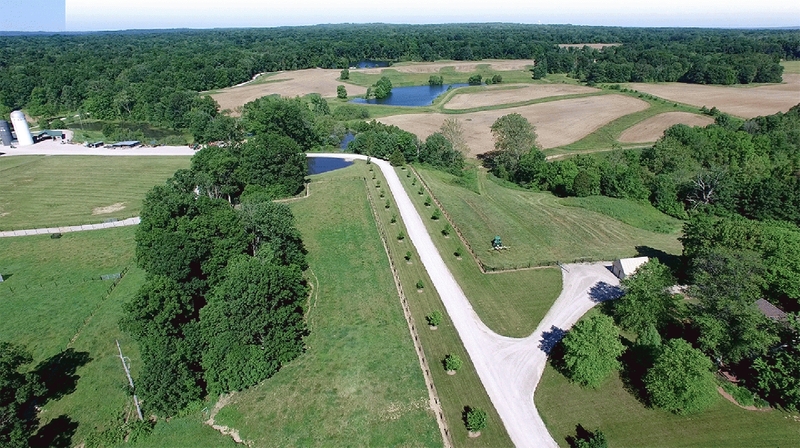 It has more than 200 acres of mixed hardwoods that provide both a beautiful setting and one that is attractive to deer, turkey and other game that are plentiful in southern Indiana,” said Gene Klingaman, executive vice president of the auction company. The property will be offered in 24 tracts, ranging in size from 9 to 98 acres. “For those who are interested in hunting, fishing and other outdoor sports, we have 11 tracts with frontage on pristine lakes and ponds. One tract has an authentic log cabin, and another has a four-bedroom home,” said Klingaman. “The 163 acres of tillable farmland and 120 acres of pasture have likewise been well managed. The pasture land has heated automatic waterers, high tensile and vinyl board fencing, 16-foot galvanized gates, a workshop, machine storage, grain storage and a livestock building,” he said. The auction will begin at 6 p.m. Tuesday, Sept. 13, at the Morgan County Fairgrounds Auditorium, 1749 Hospital Drive, Martinsville, Indiana, 46151. Online bidding is available by request and requires advance registration. Schrader personnel will be available at the property to accommodate inspections on Saturday, Aug. 20, Saturday, Aug. 27, and Wednesday, Aug. 31. Individuals seeking additional information may visit www.schraderauction.com or call 800-451-2709.